Graduation is a "journey's end at an open door"; remind your graduate that the journey goes on from there! This sampler design allows complete personalization with the graduate's name, school and date, in color choices that reflect his or her school. 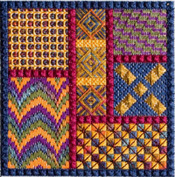 Stitches include chevron variation, crow's foot variation, Smyrna, double cross, diagonal sheaf and backstitch, with a tassel for the mortar board. Finished design is 6" x 5 ¼", 84 x 72 stitches. (Shown on 28 ct. Summer Sky hand-dyed Jobelan with DMC floss and Kreinik #4 Braid; can be stitched on 14 ct. fabric as well.) The diploma charm is included with the chart. Finished size 6" x 5 ½"